I’ve had these books for probably 40 years and have no idea how long my grandmother had them. I have a set of 27, all different titles. What can you tell me about them? Little Luxart Books were sold by mail in the early 1900s by the Robert K. Haas Publishing Company in New York. 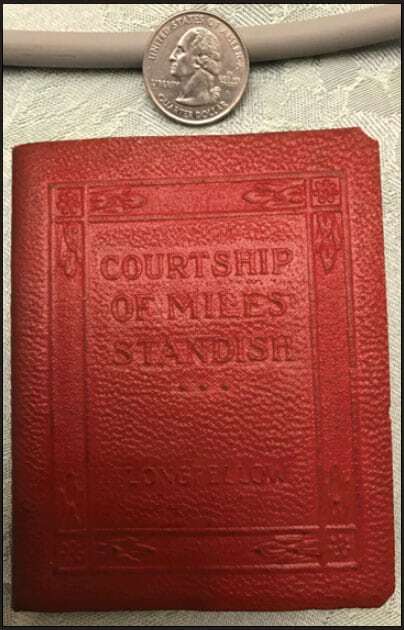 First marketed as leather or leatherette, Hass altered the name to avoid misrepresenting the red pressed-paper covers. 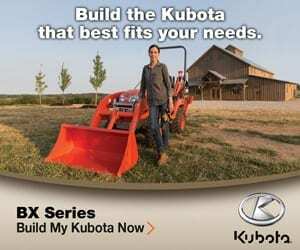 Similar sets sell today for $45 to $65. An individual book sells for $1 to $5. 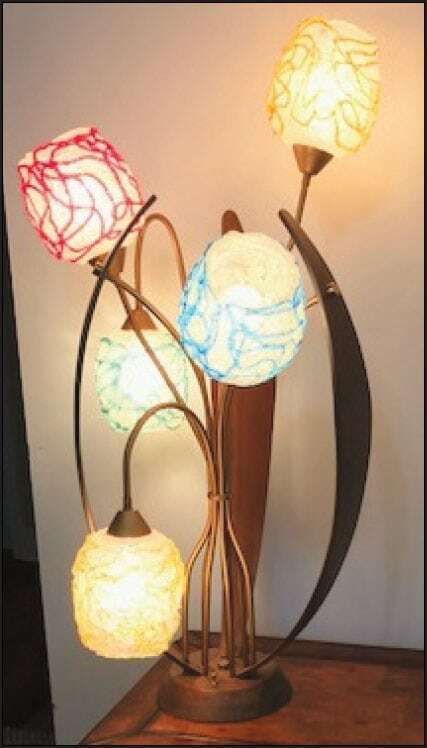 Joni submitted photographs online (without a message or information) of her five-socket, midcentury table lamp with spun-acrylic shades. She sent pictures of the lamp lighted and turned off. 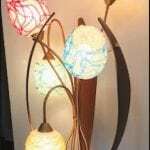 Even without the maker’s name or history, she could easily sell the lamp for $350 and, with a bit of effort, two to three times more. It screams 1960s. The shades look like crushed ice with a drizzle of color on top. 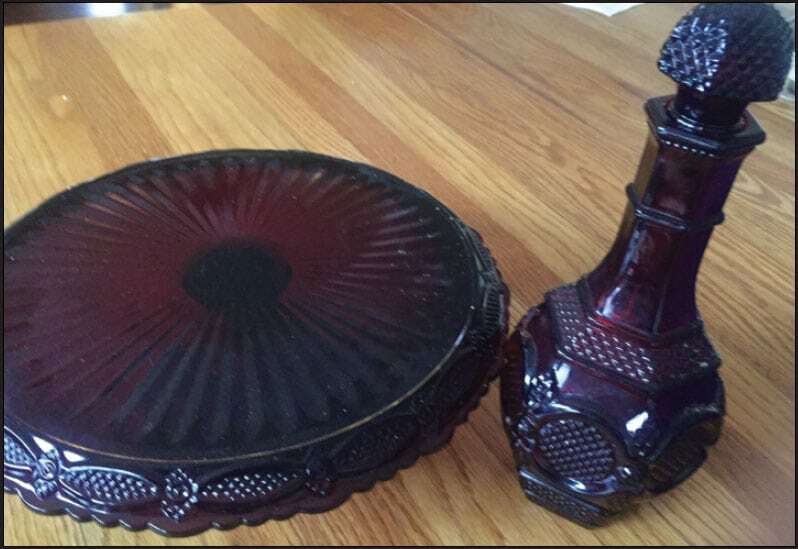 Someone in Paris, Tennessee, sent a picture of an Avon Cape Cod ruby red wine decanter and cake platform. The decanter sells for $10 to $22. The cake platform sells for around $35. Wheaton Glass Company made the deep red glass for Avon in 1975 in anticipation of our bicentennial. 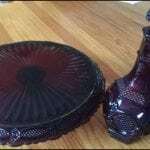 Introduced to mimic earlier Sandwich Glass made in Boston in the 1800s, it was enthusiastically collected as Avon offered different serving and place setting pieces in every campaign. It is still favored at Christmas. This picture was a gift to my mother. It’s in a 16-by-20-inch frame. It looks to be composed of a black silky fabric background with the children being large paper dolls that have been skillfully cut out. Real fabric clothing has been placed on the children, and beautiful locks of natural hair have been arranged upon their sweet little heads. The boy’s shirt has been top-stitched and has tiny buttons. He has on socks, and his shoes have been laced. The girl has rows of lace on her dress with tiny French knots holding it in place. Her socks are decorated with lavender embroidery thread, and her shoes are laced and tied. They have cut grass from green crepe paper and cut prints of flowers and a butterfly. 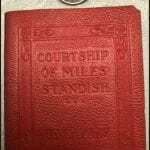 Could you shed any light on what it is and its age and value? 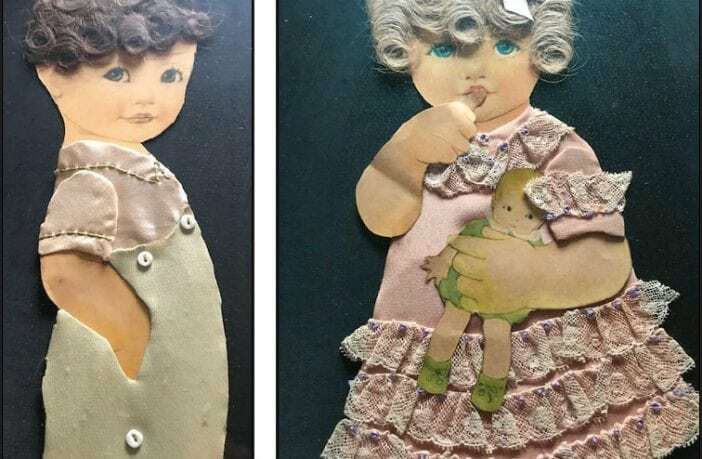 Fabric dressing paper dolls was first popular in the early 1920s and ‘30s. 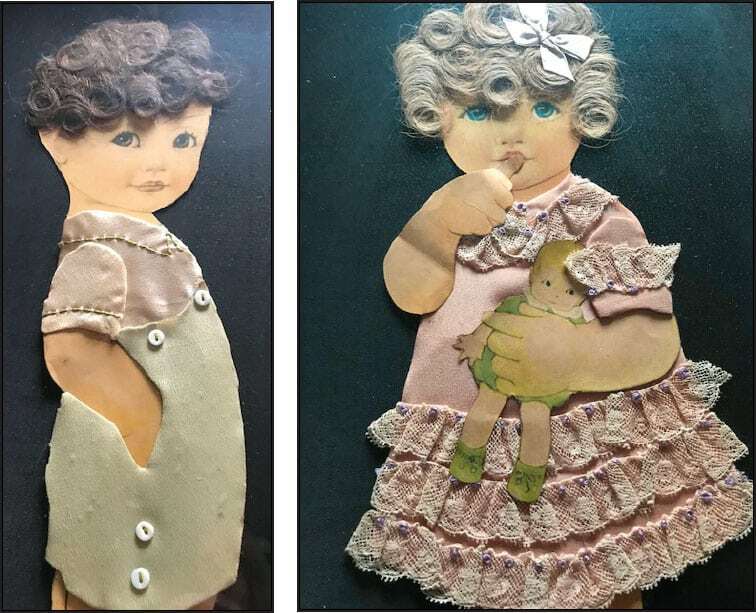 Child dolls like yours were sometimes dressed with real newborn baby clothes or the scraps left from sewing. I think some were made to utilize quickly outgrown pieces of clothing and remind mothers of their babies. Your boy and girl paper dolls with play clothes, grass and flowers might sell in the $45-to-$75 range. 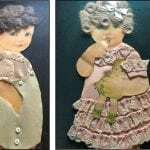 Oftentimes, crafts like this were introduced in the then-new and -popular ladies’ magazines.